Sign up to Dry July Australia 2018 and raise funds for Dry July Foundation Supporting NT. You can make a difference to people affected by cancer by supporting the Dry July Foundation. Money raised will go to organisations in the Northern Territory which offer cancer support and treatment services. Funds are awarded following a grant application round in late October each year. We’re thrilled to announce the recipient of the 2018 Dry July Foundation Grant Program in the Northern Territory. The money for the Grant Program was raised by Dry July 2018 participants, who elected to fundraise for the Dry July Foundation as part of their alcohol-free month. In October, the Dry July Foundation invited cancer support organisations to apply for a grant. Each grant application was capped at $50,000, however organisations could apply for more than one grant. Nationally, we received an incredible 171 grant applications from 65 organisations across Australia, totalling over $6.4m. With $4.1m available from this year’s Dry July, we were able to award funding to 138 projects. Since 2008, the Dry July Foundation has funded more than 1,200 projects for 80 cancer support organisations across Australia. Northern Territory Cancer Support Organisations Receive 2016 Dry July Funds. Cancer Council NT will use a Dry July Foundation grant to build a garden with outdoor furnishing and a dedicated area for art activities at Alan Walker Cancer Centre. Some patients especially from remote areas are uncomfortable sitting in the waiting area with other patients and in a confined space. Quite often they occupy the wooden bench outside. Other patients have suggested of a quiet place to relax and reflect especially when having to long waits between appointments or treatment. AWCC Aboriginal art activities are currently done outside - a garden will not only be more comfortable but provide inspiration for our artistic patients. Non-indigenous patients are also invited to do art. Cancer Council NT is using a grant award from the Dry July Foundation to make the Cancer Council NT office in Alice Springs more comforting for clients. They will be improving storage facilities to make room for new furniture, to greater utilise the space available. CCNT hosts cancer information group meetings in their office open area and see more clients in the private consultation room. 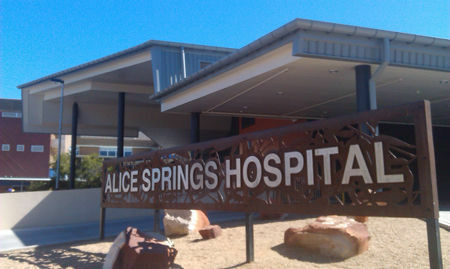 Other cancer organisations, such as CanTeen and the Leukaemia Foundation, do not have an office space in Alice Springs and these organisations could use the new private room and meeting area to see clients and network when they visit Alice Springs once these areas are updated. Dry July was pleased to provide funds for the purchase and installation of artwork in the two radiotherapy linear accelerator bunkers at Alan Walker Cancer Centre in Darwin. These illuminations aim to make the bunkers a little more welcoming for patients who are undergoing what can be a very intimidating treatment. Radiation therapy is delivered to a patient alone, in a lead lined room, so having something to look at is a welcome distraction.